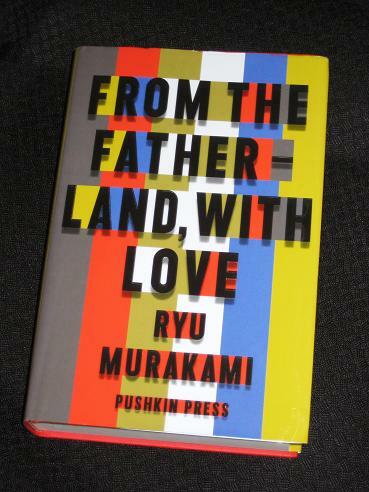 From the Fatherland, with Love (translated by Ralph McCarthy, Charles De Wolf and Ginny Tapley Takemori – review copy courtesy of the publisher) was originally released in Japan back in 2005, so its 2011 setting pushes it into the realms of speculative fiction. In this near-future scenario, Japan is on a downward spiral, economically weak and politically right-wing, and its former allies are beginning to distance themselves from Asia’s one-time powerhouse. Meanwhile, just across the sea, North Korea is slowly beginning to improve relations with its neighbours, and the US, while sticking to its hardline beliefs. Of course, if attention could be further deflected from the regime, perhaps by involving Japan in a domestic crisis, this might ease the tension on the ‘Fatherland’ even more. The writer gradually focuses more on the individuals, rendering them a little more human. The effect of relative freedom – and nice clothes – has an apparent softening effect on them, and there are times when they don’t appear all that different from the locals. Every so often, though, the writer reminds us (and usually not very subtly) that they are still, first and foremost, killing machines. There is a dawning realisation that Japan just can’t cope with this attack, and this fiddling while Fukuoka burns shows the weakness of democracy. In a landscape of vested interests, politicians are scared of taking risks and unwilling to make unpopular, risky sacrifices. You’d expect the inhabitants of Fukuoka to feel upset at being abandoned, and they are, initially at least. However, not everyone is distraught, and as time passes, many people start to think that it’s time to get on with life. Having been abandoned by Tokyo (which sees them as country hicks anyway), the locals begin to cooperate more willingly with the ‘Koryos’. It’s a Stockholm Syndrome of sorts, and the daily television broadcasts by a photogenic and charismatic Korean soldier help make the occupation more palatable. Only those locals who have closer dealings with the Koreans know that the friendliness doesn’t extend much below the surface. …however, there is another, less flattering, similarity with that book – it’s too long. There are frequent info dumps, pages and pages of unnecessary information which can slow the story down. At times, the writer gives lists of names, with plenty of unnecessary backstories – there’s a Tolstoyan list of characters at the start of the book, but most of them are superfluous. There’s also a whole lot of of repetition, and you can’t help feeling that the book needed some more critical editing (obviously, writers called Murakmi are immune to this sort of editorial interference…). I have been very moved by Ryu Murakami's work; both Piercing and Coin Locker Babies will long be in my memory for the way they told of human angst. This one, which seems to address political ideas, interests me less. Especially, as you say, if it's long. I do not have time for long, nor boring, right now. I only am seeking an escape from the most dreadful heat I've experienced in years, as well as a place to dwell mentally other Han wih the worries of Syria and our potential involvement. Ah, I digress, but I don't want political anything right now. I agree, despite the number of pages the pacing is pretty fast, perhaps editors and translators are wary of cutting too much, (if anything), from both of the Murakami's novels, as maybe if it were perhaps discovered that parts of the novel were removed this too would cause controversy and consternation among many readers, maybe this could be said for all sizable novels in translation. I think I'd prefer a translation to be closer to the original rather than having it snipped to make it more palatable, 1Q84 and From the Fatherland, With Love are both ambitiously large novels, but I think I prefer them this way rather than being presented with a lite version of either 1Q84 or FTFWL. me. – A few years, I would have agreed heartily – now, I'm not so sure. The more I hear about the lack of real editing (by the standards of the English-speaking world) in some countries, the more I think that judicious editing can be a good thing. I was talking to Andrés Neuman, the Argentinean-Spanish writer, about this, and he was very positive about the rigorous process his books went through in the transformation from Spanish to English (even to the extent where he went back and made changes to the original based on the translation…). I think that although 1q84 & FTFWL are both ambitious novels and also seem to collate both of the authors themes and obsessions I believe FTFWL was the more successful as it worked better as a whole 1q84. Gary – I'd have to disagree here. While '1Q84' was widely criticised, I think it was judged on what people wanted (genius, perfection) rather than what it was (good, interesting, if a little bloated). It was still a thought-provoking work of literary fiction. Ryu's effort is too thriller-like for me to really love it, even if he does capture the Japanese societal malaise nicely at times.